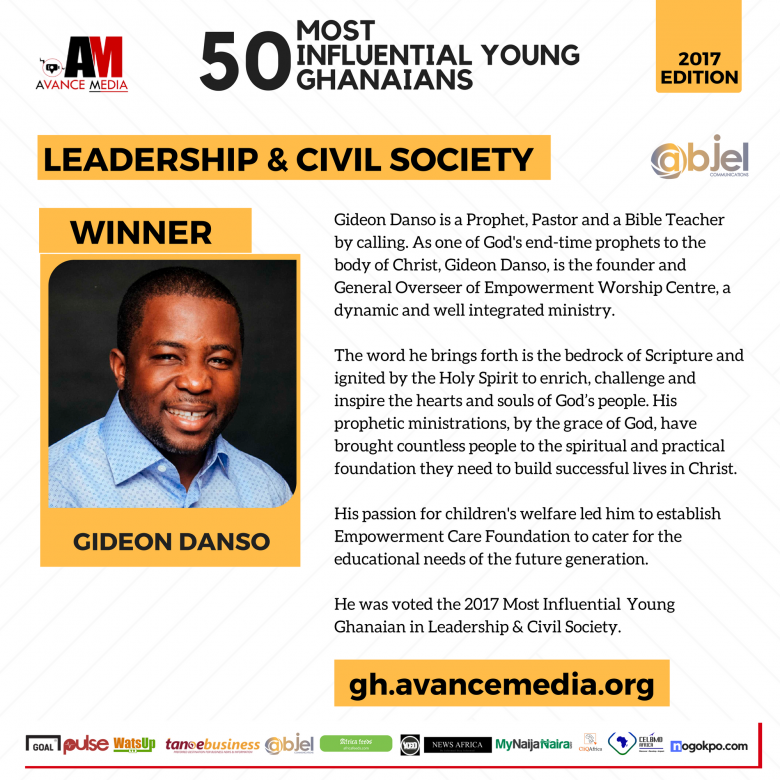 After a successful Poll by international reputed rating establishment, Avance Media in partnership with Abjel Communications, Gideon Danso, Founder of Empowerment Worship Center has been voted the 2017 Most Influential Young Ghanaian in Leadership & Civil Society in one of the most credible and respected rankings system that honours youth excellence in Ghana. 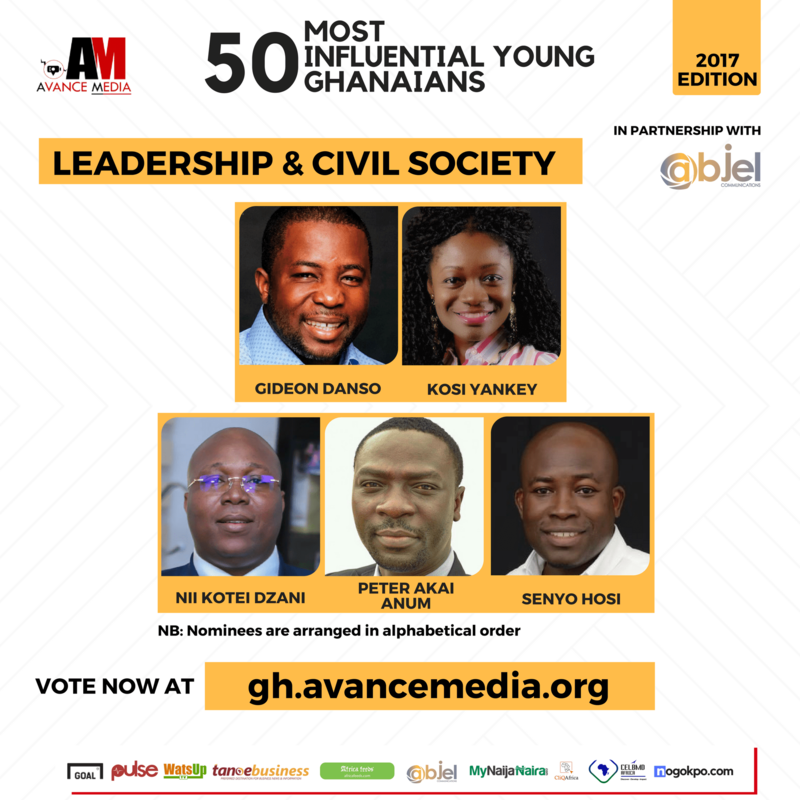 Below are the Most Influential Young Ghanaian in Leadership & Civil Society as voted by the Public. 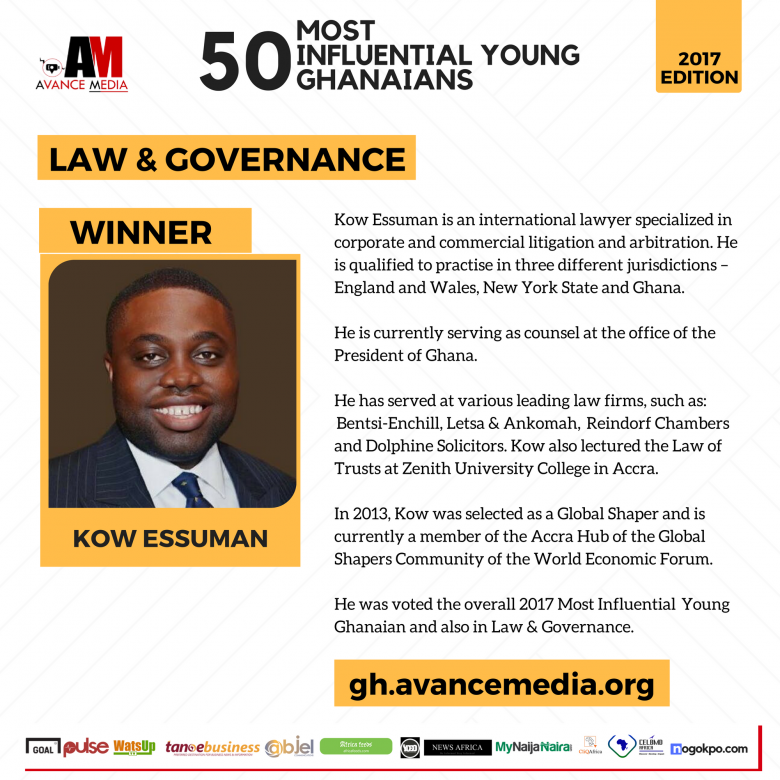 The poll which drew public participation from over 90 countries voted Lawyer Kow Essuman as the Most Influential Young Ghana. Empowerment Worship Center’s Founder, Pastor Gideon Danso, Brian Amoateng Outreach Ministries’ President, Prophet Brian Amoateng, Member of Parliament and Deputy Minister of Information, Hon. 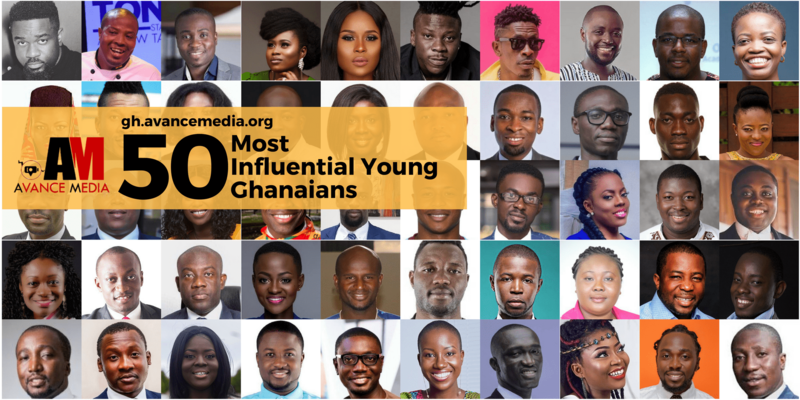 Kojo Oppong Nkrumah and celebrity blogger, Ameyaw Debrah also made it the top 5 most influential young Ghanaians respectively. Prince Akpah, MD of Avance Media explained that, the ranking which features young people creating positive influence in Ghana will be used to inspire young people across the nation as various winners will be encouraged to embark on a homecoming visit to their former Senior High Schools to share their success stories and mentor students who they inspire. 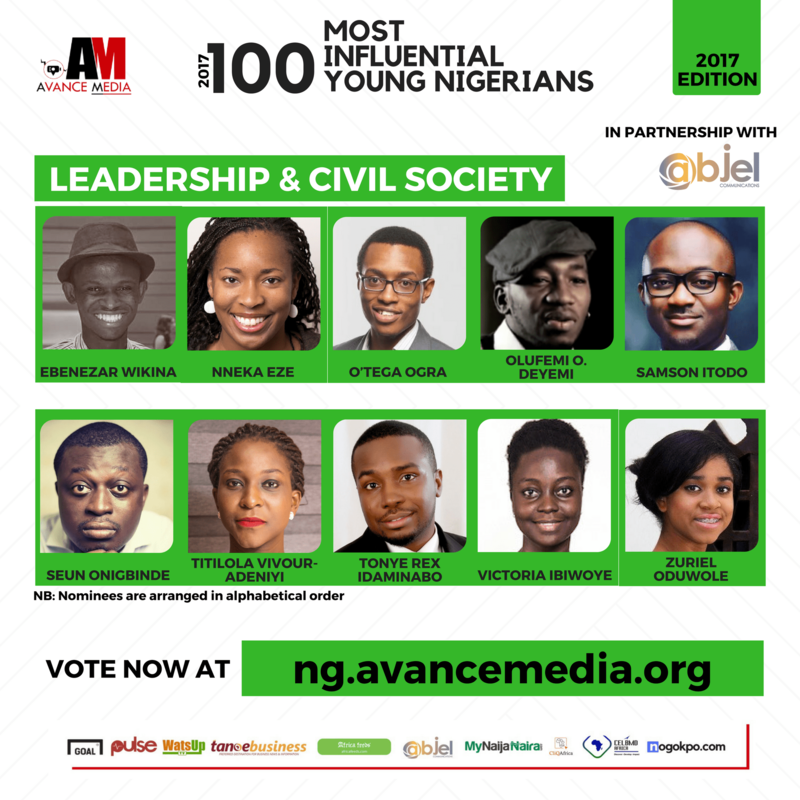 Profile of Gideon Danso, Ghana’s Most Influential Young Person in Leadership & Civil Society. Gideon Danso is a Prophet, Pastor and a Bible Teacher by calling. As one of God’s end-time prophets to the body of Christ, Gideon Danso, is the founder and General Overseer of Empowerment Worship Centre, a dynamic and well integrated ministry. The word he brings forth is the bedrock of Scripture and ignited by the Holy Spirit to enrich, challenge and inspire the hearts and souls of God’s people. His prophetic ministrations, by the grace of God, have brought countless people to the spiritual and practical foundation they need to build successful lives in Christ. His passion for children’s welfare led him to establish Empowerment Care Foundation to cater for the educational needs of the future generation. He was voted the 2017 Most Influential Young Ghanaian in Leadership & Civil Society. 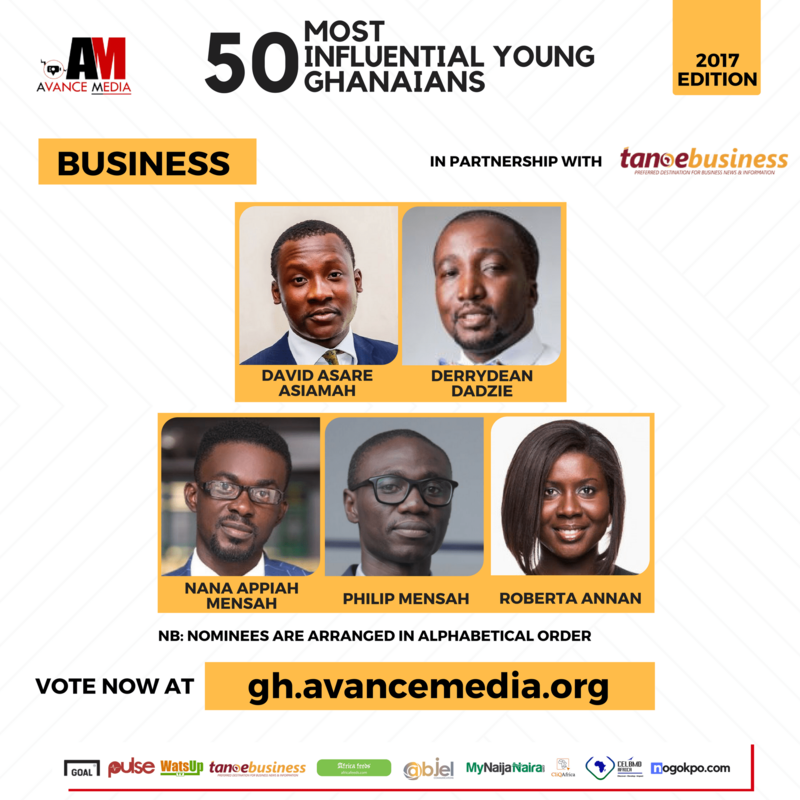 Below are the Most Influential Young Ghanaian in Business as voted by the Public. 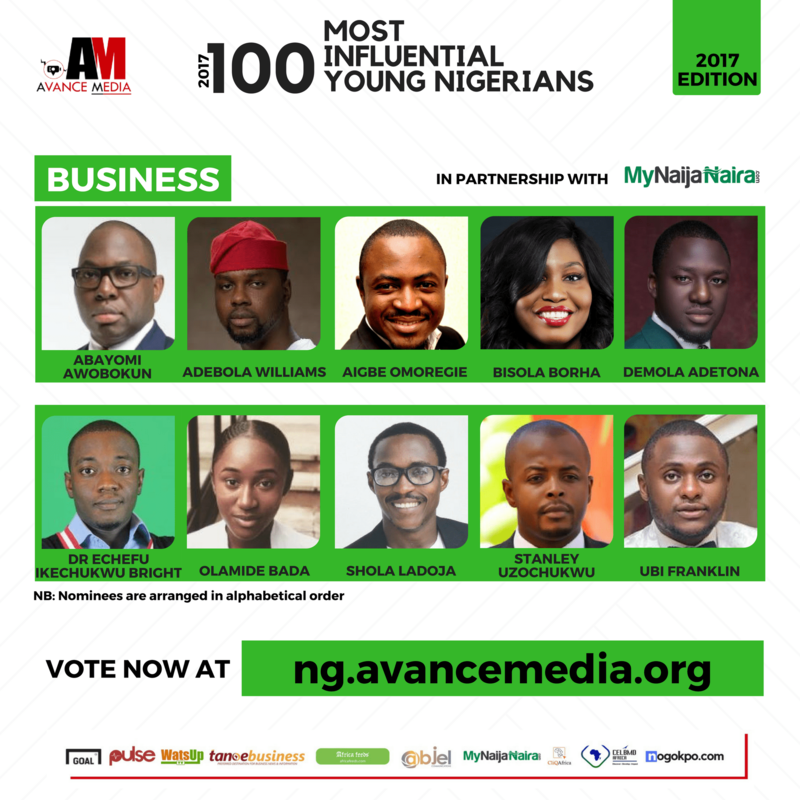 Profile of Nana Appiah Mensah, Ghana’s Most Influential Young Person in Business. Nana Appiah Mensah, CEO of Zylofon Media Company Limited, Menzgold Ghana Co. Limited, Brew Marketing Consult etc is a young Ghanaian enterpreneur. He leads and manages more than 2,000 employees and has successfully maintained stable business in flows, steady growth, formidable and highly resilient corporate brands. He is highly noted for his investment in Gold trading and Exports business, Security, Oil and Gas, Real Estate, Music, Arts & Craft, Culture and the entertainment and creative arts industry as a whole. He is also the founder of Nana Appiah Mensah Mission, a non- profit organisation. 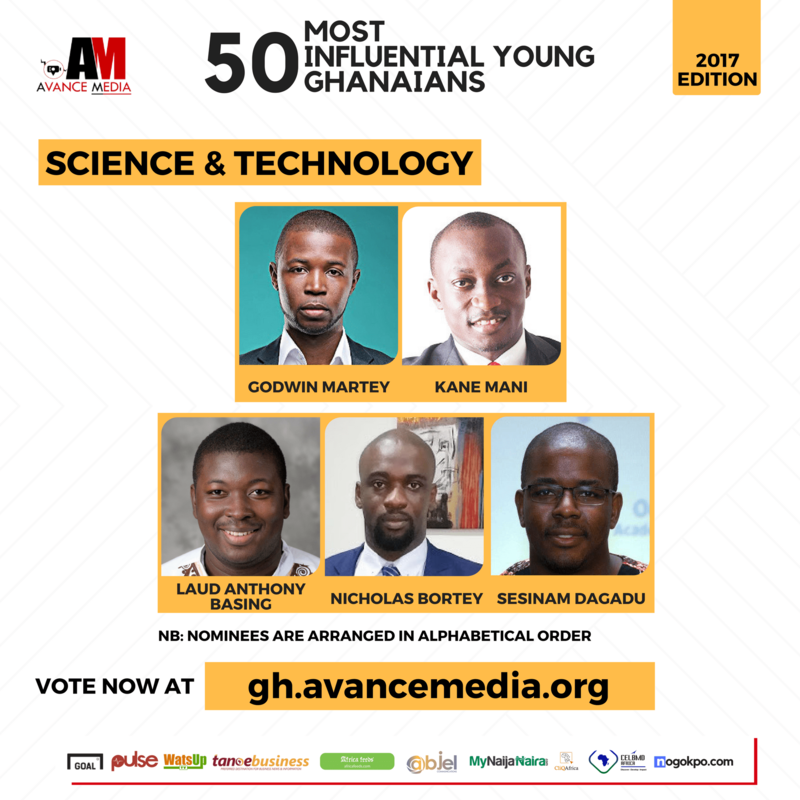 He was voted the 2017 Most Influential Young Ghanaian in Business. 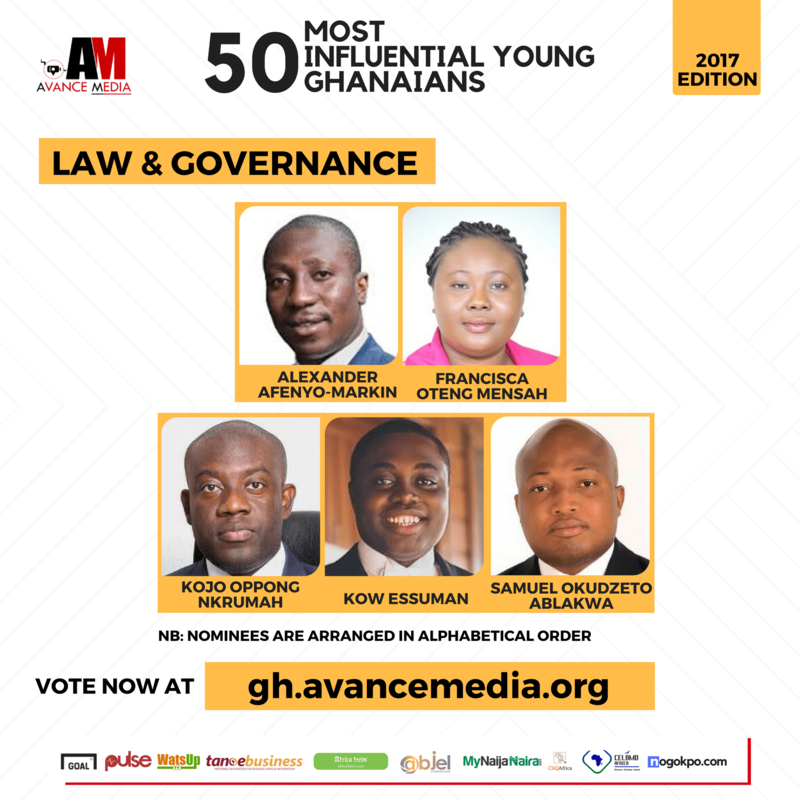 After a successful Poll by international reputed rating establishment, Avance Media, Lawyer Kow Essuman has been voted the 2017 Most Influential Young Ghanaian in Law & Governance in one of the most credible and respected rankings system that honours youth excellence in Ghana. 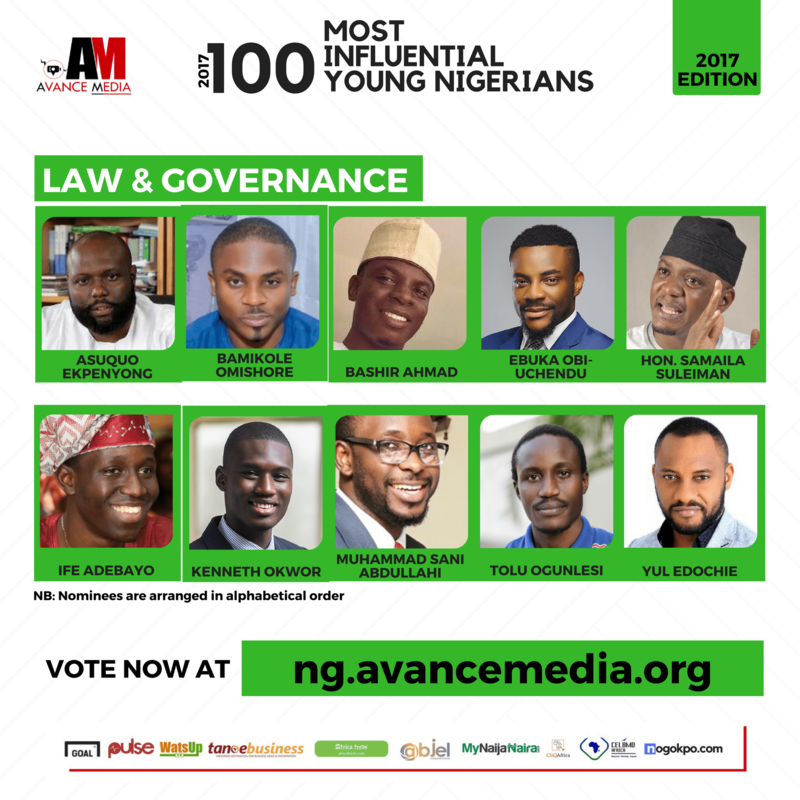 Below are the Most Influential Young Ghanaian in Law & Governance as voted by the Public. Profile of Kow Essuman, Ghana’s Most Influential Young Person in Law & Governance. Kow Essuman is an international lawyer specialized in corporate and commercial litigation and arbitration. He is qualified to practice in three different jurisdictions – England and Wales, New York State and Ghana. He is currently serving as counsel at the office of the President of Ghana. He has served at various leading law firms, such as: Bentsi-Enchill, Letsa & Ankomah, Reindorf Chambers and Dolphine Solicitors. Kow also lectured the Law of Trusts at Zenith University College in Accra. In 2013, Kow was selected as a Global Shaper and is currently a member of the Accra Hub of the Global Shapers Community of the World Economic Forum. He was voted the overall 2017 Most Influential Young Ghanaian and also in Law & Governance. 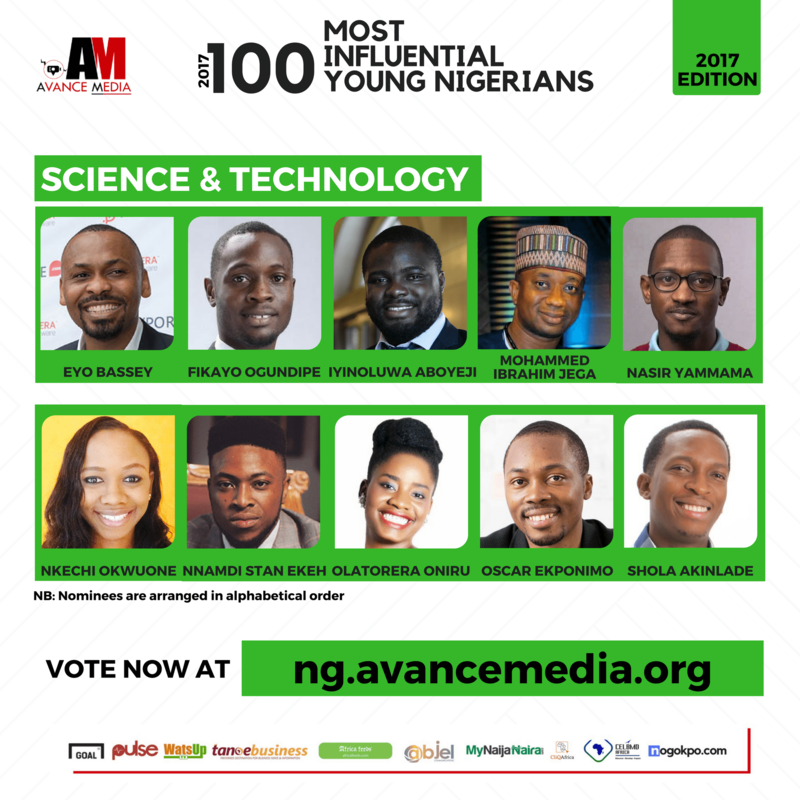 Finalists for Avance Media’s 100 Most Influential Young Nigerians ranking 2017, honouring distinguished young Nigerians, have been announced. 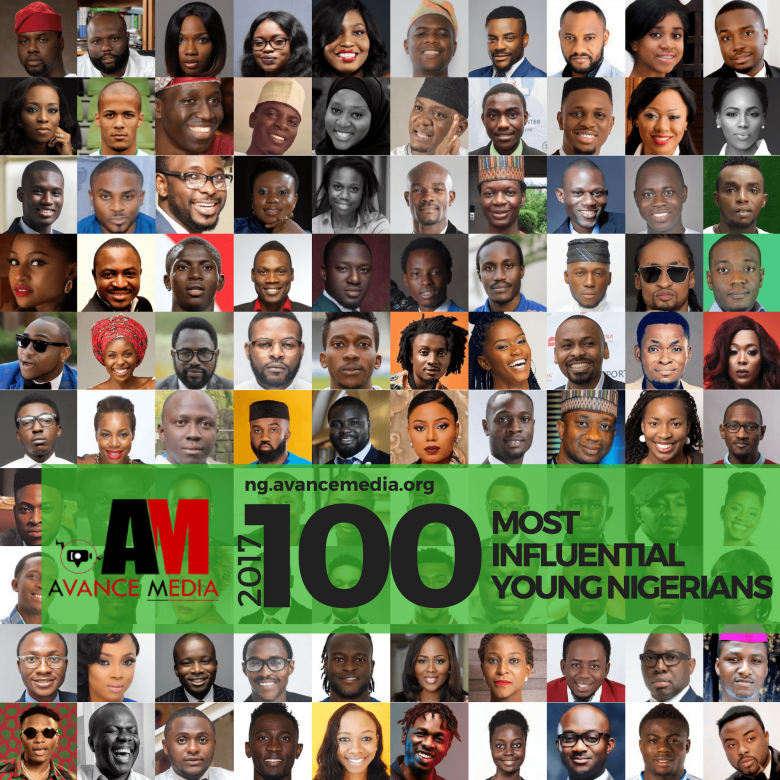 The 100 Most Influential Young Nigerians ranking recognises distinctive service across 10 different categories: Business, Entertainment, Law and Governance, Leadership and Civil Society, Lifestyle, Media, Personal Development and Academia, Science and Technology, Sports and Social Enterprise and Philanthropy. Winners will be announced on 11th January, 2018 as public voting is expected to be closed on 4th January, 2018. 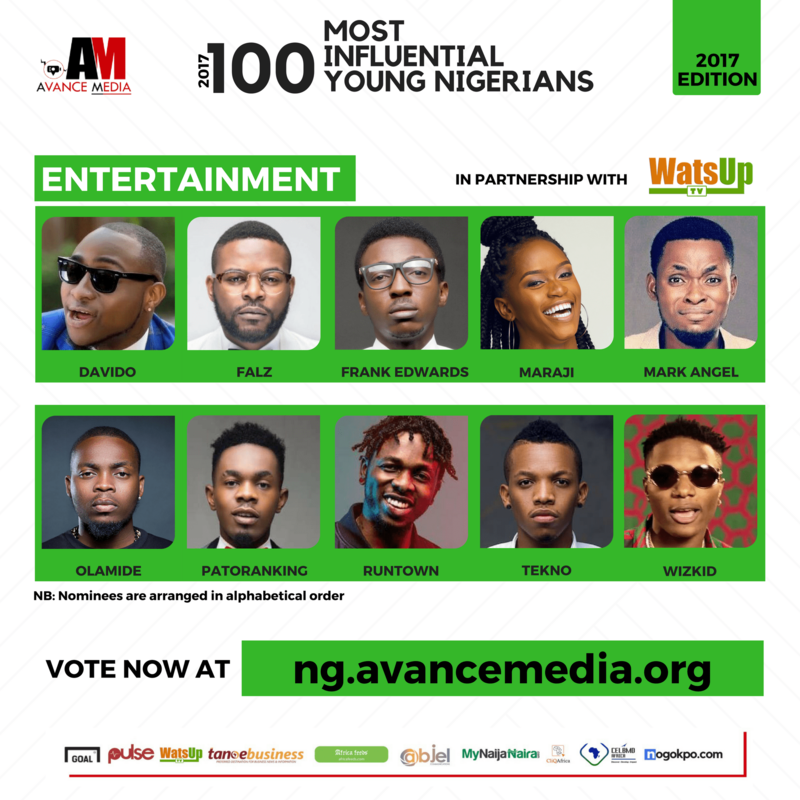 Hailed as one of the most credible, Avance Media’s Most Influential Young Nigerians rankings is the most respected system that honours youth excellence in Nigeria. The 2017 Nigeria ranking is the second in the series. 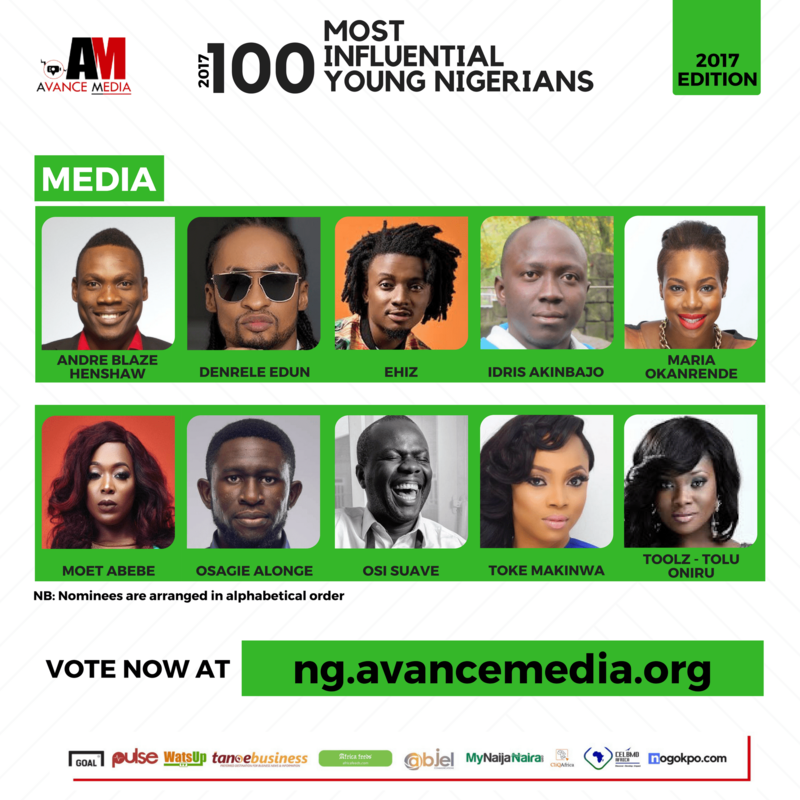 The previous edition ranked Actress, Funke Akindele as the Most Influential Young Nigerian for 2016. 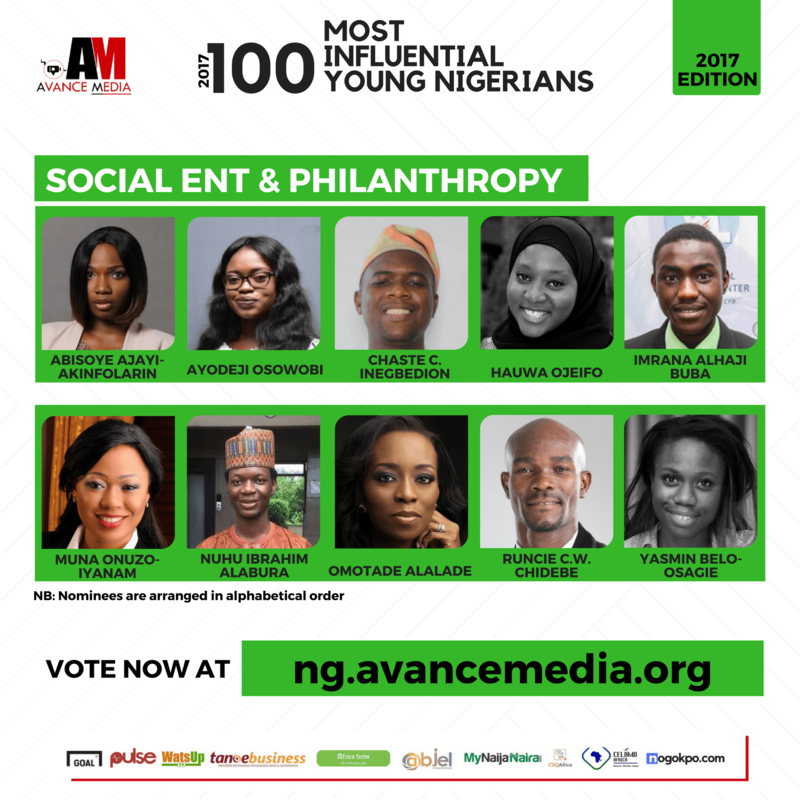 MD of Avance Media, Prince Akpah explains that this year’s influential young Nigerian is someone whose work has undoubtedly had a positive impact in Nigerians life. 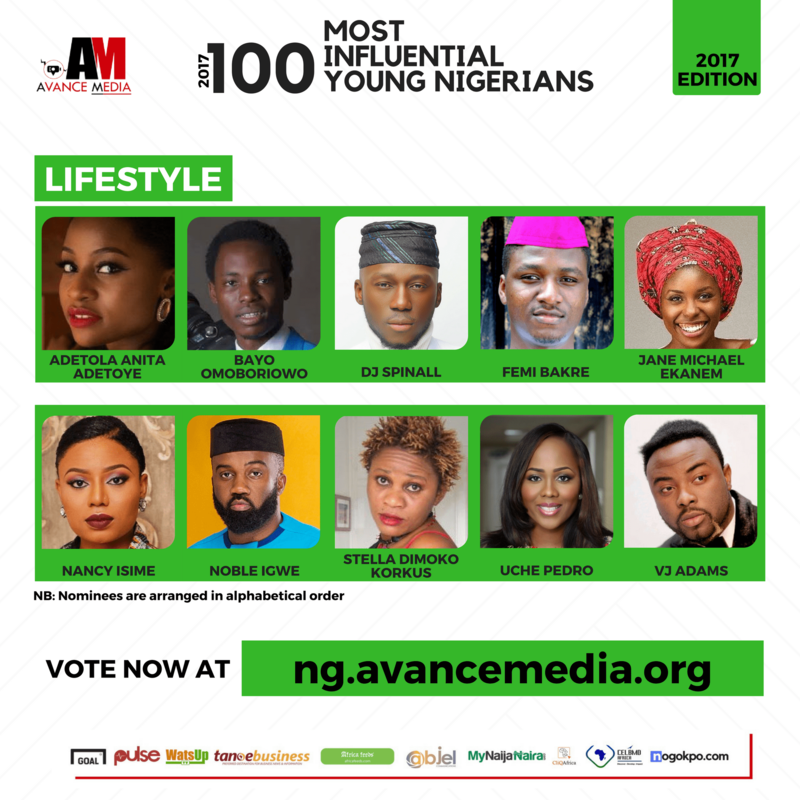 The nominees have all excelled in their various endeavors, working to improve the lives of others, through hardwork, personal sacrifice and in most instances, made bold and brave commitments. 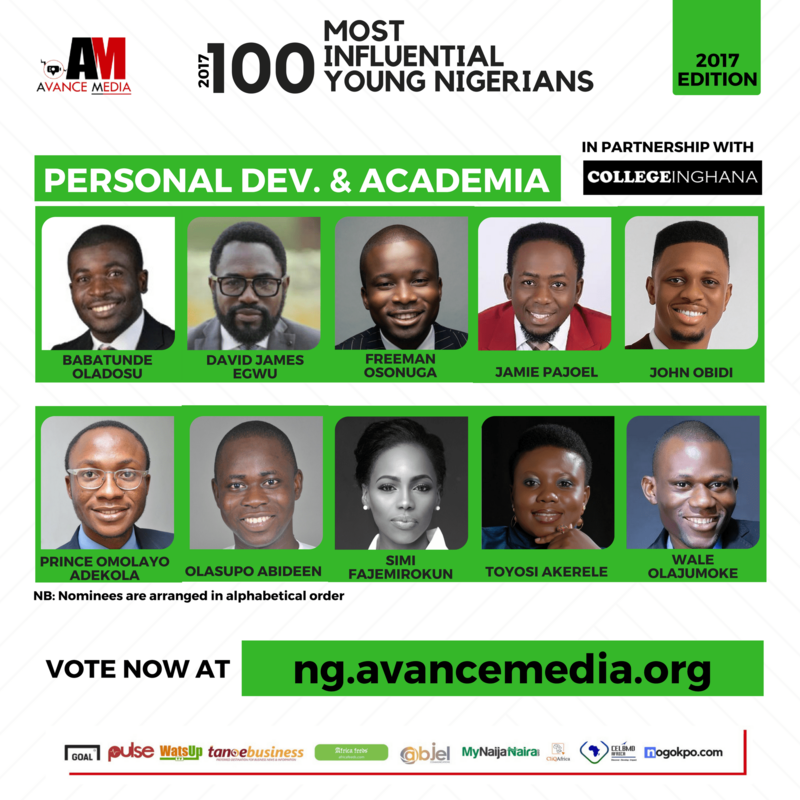 Public voting has officially opened on ng.avancemedia.org to determine the overall 2017 Most Influential Young Nigerian, and winners for the 10 categories. Similar rankings by Avance Media and partners are currently ongoing in Cameroon, Tanzania, Ghana, South Africa, DR Congo and Kenya. 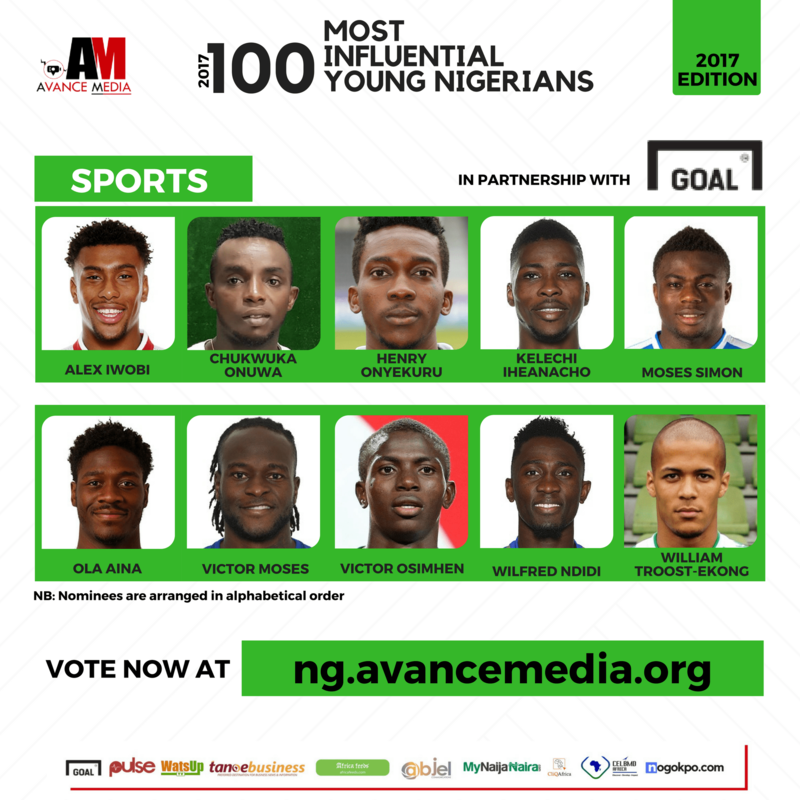 The 100 Most Influential Young Nigerians ranking is proudly organised by Avance Media in partnership with Goal.com, ReputationPoll.com, Abjel Communications, WatsUp TV, Citizen NG, TANOEBusiness.com, News for Africa Online, My Naija Naira, Dream Ambassadors Foundation GH, CliqAfrica, Pulse Nigeria, Africa Feeds, and CELBMD Africa. 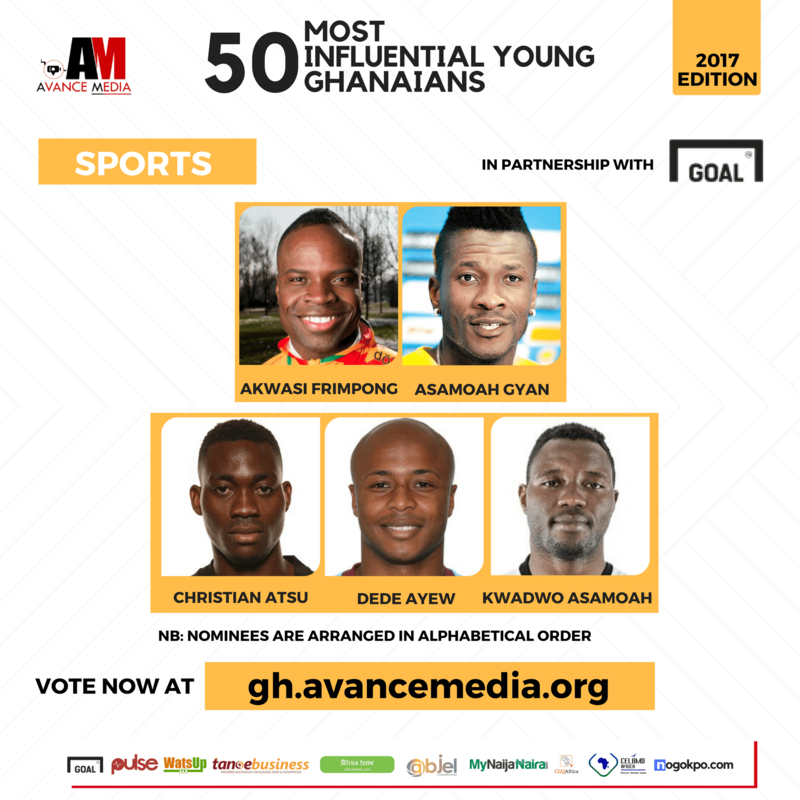 Finalists for Avance Media’s 50 Most Influential Young Ghanaians ranking 2017, honouring distinguished young Ghanaians, have been announced. 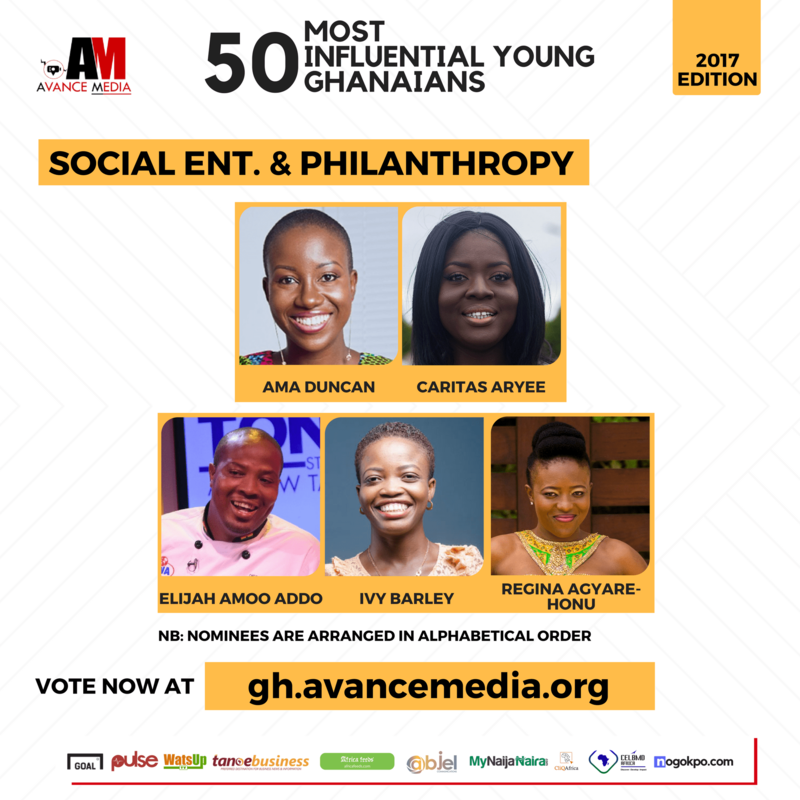 The 50 Most Influential Young Ghanaians ranking recognises distinctive service across 10 different categories: Business, Entertainment, Law and Governance, Leadership and Civil Society, Lifestyle, Media, Personal Development and Academia, Science and Technology, Sports and Social Enterprise and Philantrophy. 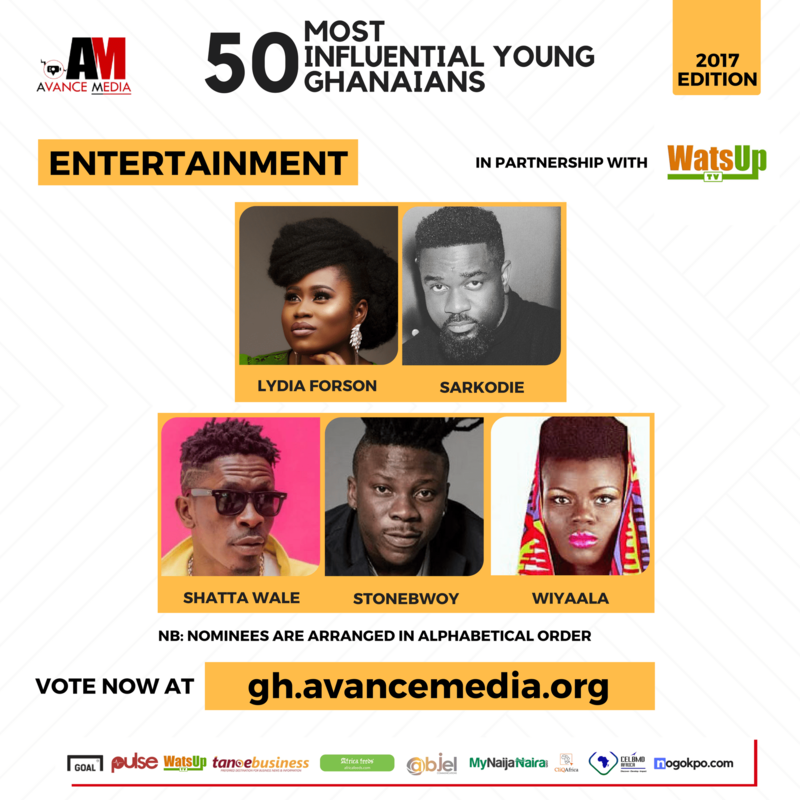 Hailed as one of the most credible, Avance Media’s Most Influential Young Ghanaian rankings is the most respected system that honours youth excellence in Ghana. The 2017 Ghana ranking is the third in the series. 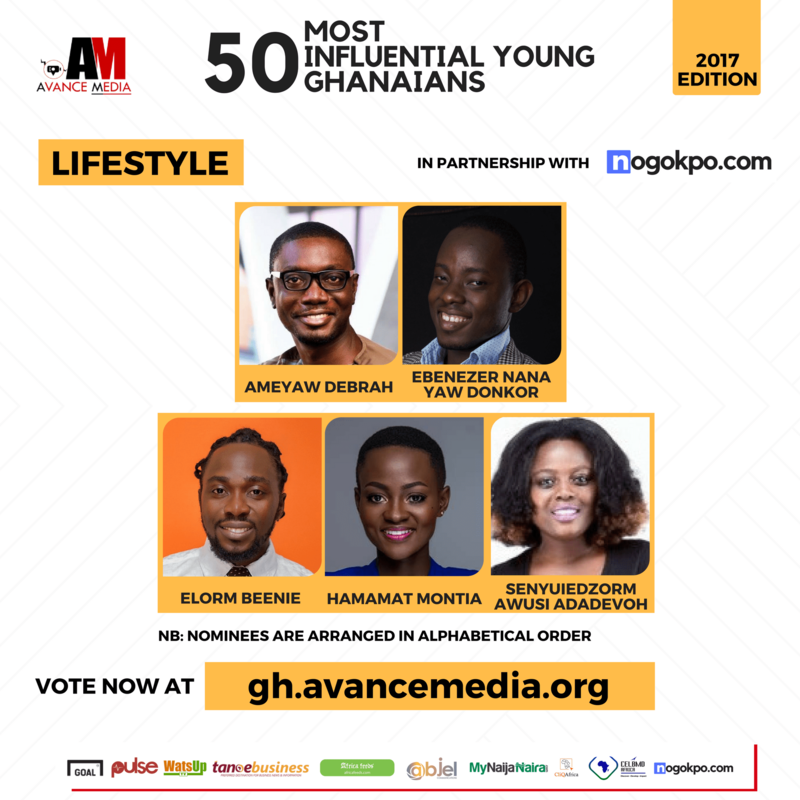 Previous editions have ranked investigative journalist, Anas Aremeyaw Anas as the Most Influential Young Ghanaian for 2015 and 2016. 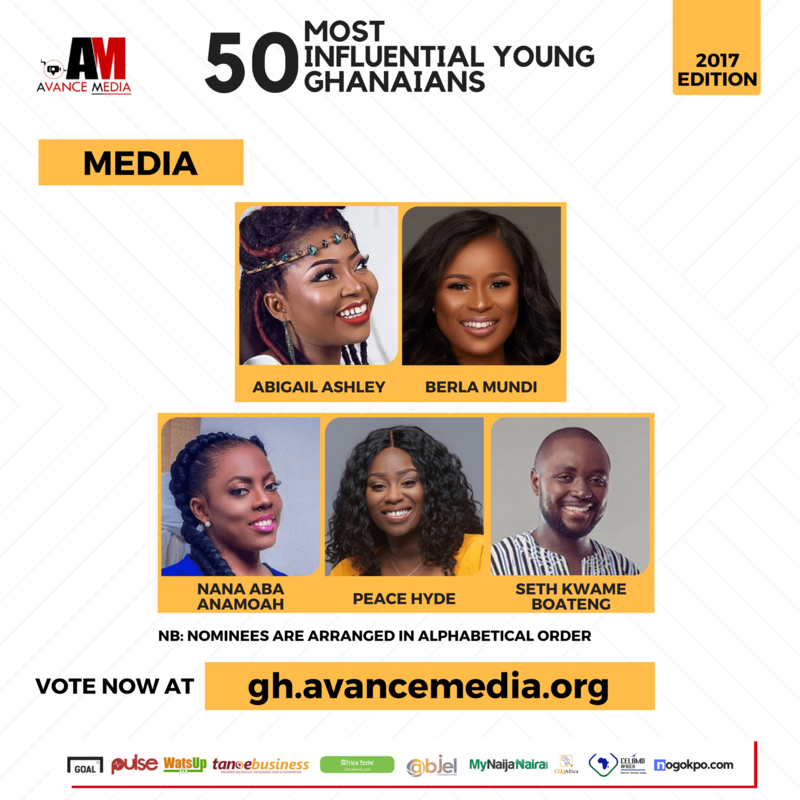 Public voting has officially opened on gh.avancemedia.org to determine the overall 2017 Most Influential Young Ghanaian, and winners for the 10 categories. Similar rankings by Avance Media and partners are currently ongoing in Cameroon, Tanzania, Nigeria, South Africa, DR Congo and Kenya. 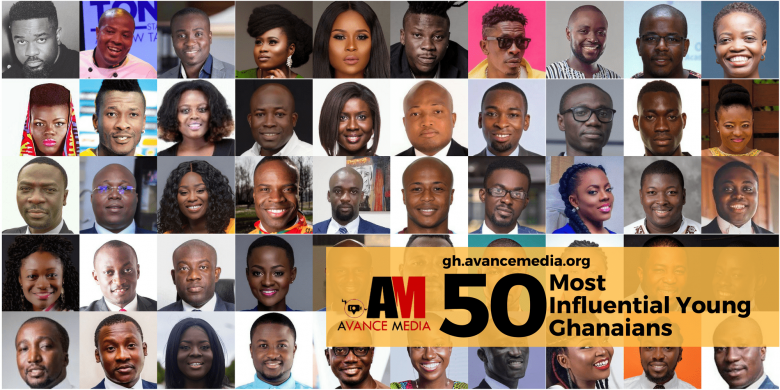 The 50 Most Influential Young Ghanaians ranking is proudly organised by Avance Media in partnership with Goal.com, ReputationPoll.com, Abjel Communications, WatsUp TV, TANOEBusiness.com, My Naija Naira, Dream Ambassadors Foundation GH, CliqAfrica, Pulse Ghana, Africa Feeds, and CELBMD Africa.